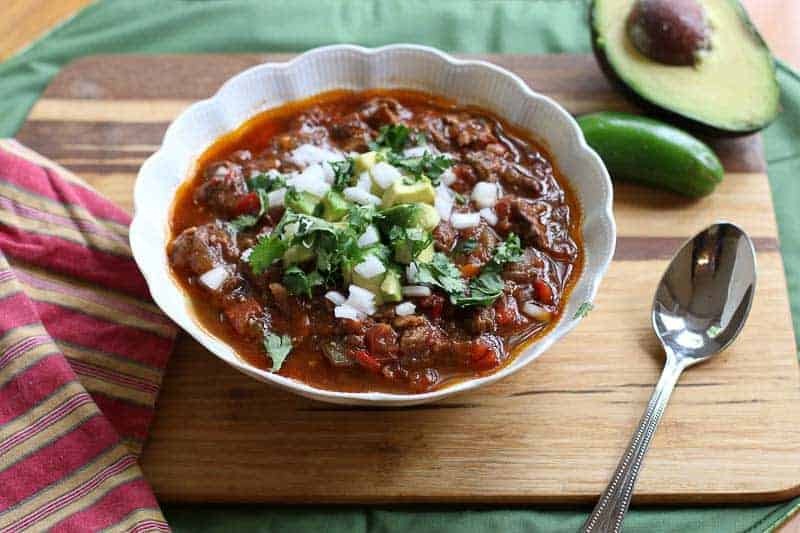 This Bison, Bacon, and Pot Roast Paleo Chili Recipe is full of amazing flavor with very little guilt. 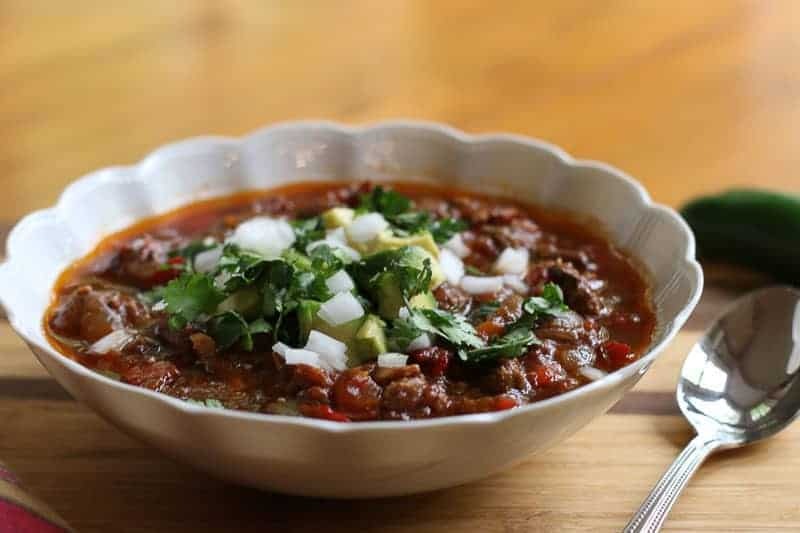 A heaping bowl of this tasty, spicy chili will warm you up and have you coming back for more. There are few things better in winter than getting out of the bitter cold and settling in a warm cozy kitchen with a hot, hearty bowl of homemade soup. 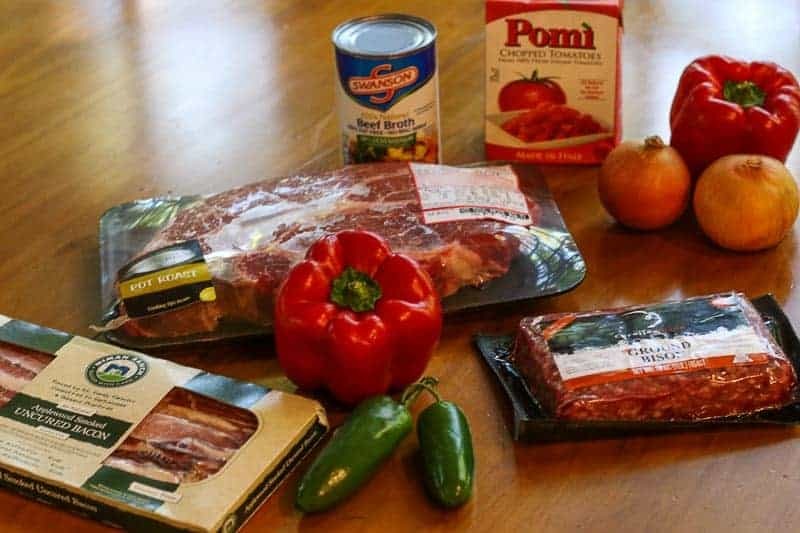 This Bison, Bacon, and Pot Roast Paleo Chili Recipe is full of amazing flavor with very little guilt. A simmering pot of this tasty, spicy chili will warm you up and have you coming back for more. I tried the Paleo diet for about two weeks. I felt amazing. But I have to say… I missed my cheese. So I am back to my low-carb lifestyle and eating the bad stuff (sugar, pasta, bread) on a moderation. This recipe is a winner, however, even without the cheese. And it is low carb… so why not? 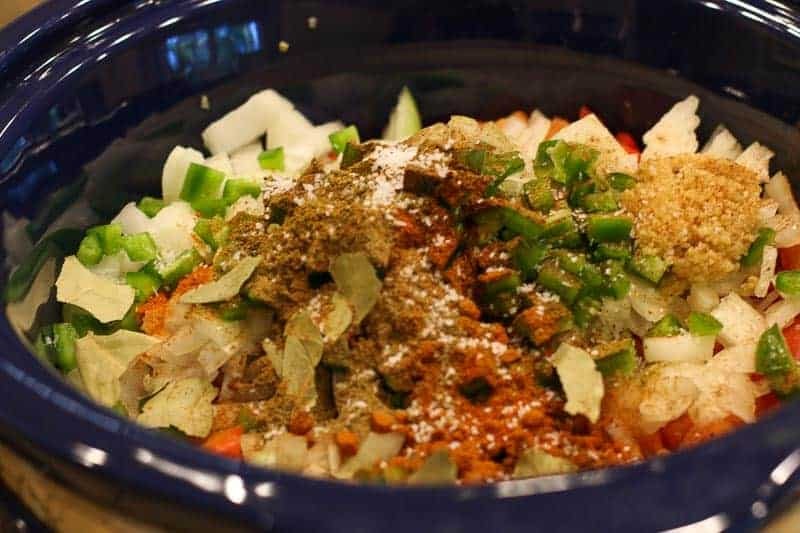 The key to making this Paleo chili wicked good is to use only the best, high quality ingredients. I love the taste of bison. It is naturally lean, but full of flavor. It does not taste gamey at all. I actually prefer it over the typical ground beef. You will need a paleo friendly bacon. I use Niman Ranch All Natural Bacon because it has no sugar, nitrates, hormones, or antibiotics, but has quality in taste. I am a HUGE FAN of the POMI chopped tomatoes. The cheaper tomato cans just don’t compare. It is like the difference of a beautiful fresh grown tomato from the garden with that lovely vine ripened smell thrown in a box compared to the store bought half green, barely red tomato that gives off a weird smell thrown in a can…. If you have never tried Pomi tomatoes, do so. It really makes a dish POP with FLAVOR! If you don’t use Pomi, use a really great brand. When eating healthy, you have to rely on all those good ingredients working together to make you fall in love with the dish. These ingredients together will have your taste buds jamming like they are dancing to a Black Eyed Peas song…. So don’t cut corners and buy the poor quality ingredients. If you do, don’t blame me for your dish tasting boring…. just saying. There isn’t too much in the prepping. Just dice all your veggies. Trim off the fat and chop the roast. Chop and cook the bacon. Then throw everything in a crock pot and cook on low for six hours. After that… BOOM! 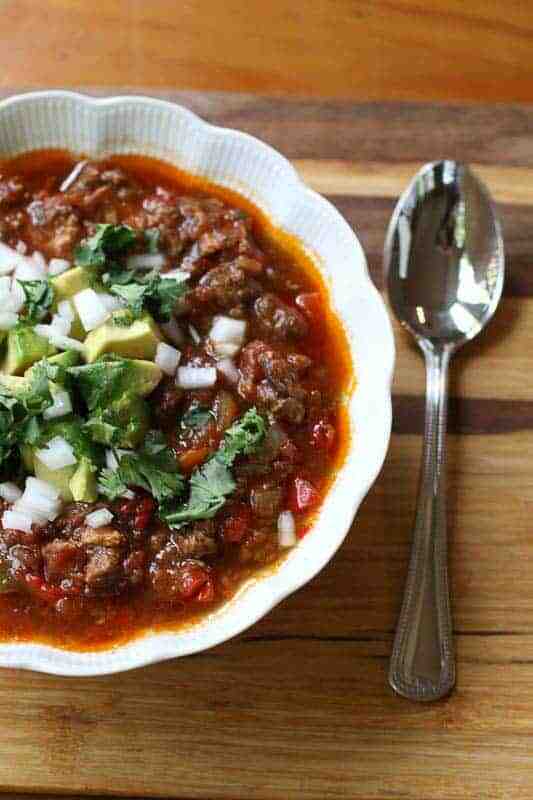 You will be going silly over some paleo chili! I like to garnish mine with onions, avocado, and cilantro… BUT if you are like my husband and are not eating Paleo, you can add some sharp cheddar cheese. 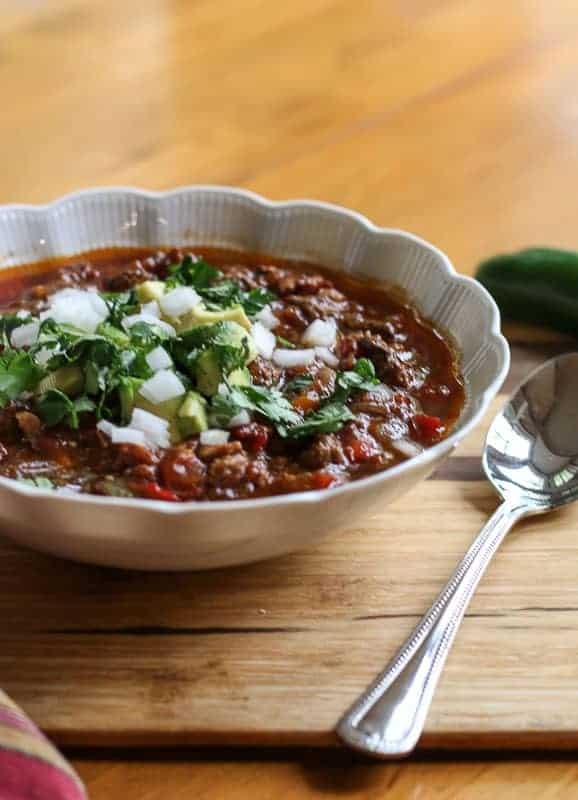 This recipe was inspired from Primal Praline’s version: Paleo Two Cows and One Pig Chili. Isn’t that the coolest name? Be sure to check out her recipes. She has AMAZING Paleo recipes that you will love whether you are a Paleo Eater or Not! I adapted this recipe to fit my style and needs, but her version is incredible also. Check out these low carb recipes also from my website: Zucchini Curry Soup, Low Carb Spinach Pizza Crust, and Low-Carb Creamy Bruschetta Chicken. There are few things better in winter than getting out of the bitter cold and settling in a warm cozy kitchen with a hot, hearty bowl of homemade soup. 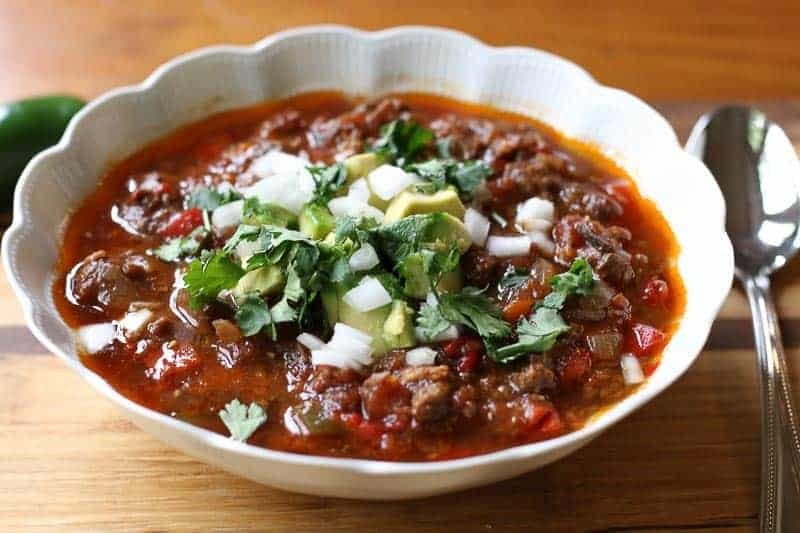 This Bison, Bacon, and Pot Roast Paleo Chili, cooked in a slow cooker is full of amazing flavor with very little guilt. Garnish with cilantro onions, and avocado. If not eating Paleo, add cheese. Trim off fat from chuck roast. Chop. I Love Niman Ranch. I used to have a cookbook published from them that featured recipes from the ranchers and farms they purchased from . It was cool, but it is lost. This beautiful recipe is a great addition to my low carb Pinterest board. Thank so much for this great recipe! This looks so good Katie!! I`m all about chili!! Just wish we could get Bison down here. Oh my goodness! This sounds amazing. I know my husband would really love this dish.